A brand new report recommends that the National Security Agency's spying program stay in place, but urges the President to rein-in the NSA's massive collection of cell phone and internet data. The controversial program has sparked concern fury from foreign leaders, concerned about reports that the United States has been spying on them. Unfortunately for President Obama, that's just one item on his list of political headaches. The United States' delegation to the upcoming Winter Olympics in Russia won't include a member of President Barack Obama's family or an active cabinet secretary, but it will include openly gay athletes – a clear jab at Russia's recent anti-gay laws. FULL STORY. 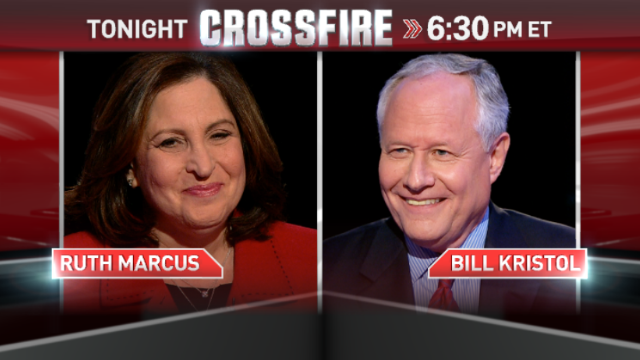 Washington Post op-ed columnist Ruth Marcus and The Weekly Standard editor Bill Kristol are in the #Crossfire, joining host S.E. Cupp and Van Jones to debate these topics and other issues facing President Obama. We want you to weigh in: Do you think the U.S. should boycott the Olympics in Russia? Vote by tweeting Yes or No using #Crossfire or comment on our Facebook post. View results below or through our Poptip results page. Obama is the most radical, destructive and worst President in history. He is arrogant, a pot head, lazy (maybe works 10am to 4pm) incompetent, lawless, a fraud, never had a real job, aloof and a COMMUNIST. Obama and the Democrat party are continuing to destroy the great US economy. In almost five years they have; deficit spent $7.2 trillion (most of any Pres.) with nothing to show for it, increased national debt to $17.2 trillion and counting, real unemployment rate of 18%, no job growth, 8.5 million lost jobs, 90 million not working, black/hispanic unemployment over 20%, they hate oil/coal industries, fossil fuels, military, private sector, success, constitution, right to bear arms, over 2,260 soldiers killed in Iraq/Afgn since Obama became Pres., one in five people in poverty (highest ever), created disastrous Obamacare that has increased rates, cancelled insurance, lost doctors, is largest tax increase in history, destroy jobs and the economy and now costs $3 trillion, wasted billions of taxpayer funds on scam clean energy deals like Solyndra and Ener1 to campaign donors, foreign policy of cowardice and appeasement that has allowed at least two terrorist attacks, Benghazi and Boston, supports worst Ex Sec. of State in history, Hillary Clinton, who is responsible for the murder of Libyan ambassador and three staffers in Benghazi, supports worst AG in history Eric Holder, who is responsible for killing a border agent and the AP scandal, 48 million on food stamps and increased business killing govt regulation/employment more than any other Pres. Obama should be IMPEACHED. since Patriot Act 1 and 2 the gov/t has erroneously promulgated the insane idea that by de-privatization of every single private life & family US wide & internationally their paranoia gets better. the opposite is the case. paranoia has increased to the extent that this administration no longer recognizes that it's 1st duty is to the individual citizen, not to the state. to destroy every single private life (continual spying) will not add one iota of security & will bankrupt the cascading finances of the nation. Remember the position of Van Jones and Cup in today's Crossfire episode (Ruth Marcus and Bill Kristol). If CNN deviates from this position, please send me an email.